Holy Baptism uses water and the Word of God to give us salvation. It is how we receive God’s grace and forgiveness. 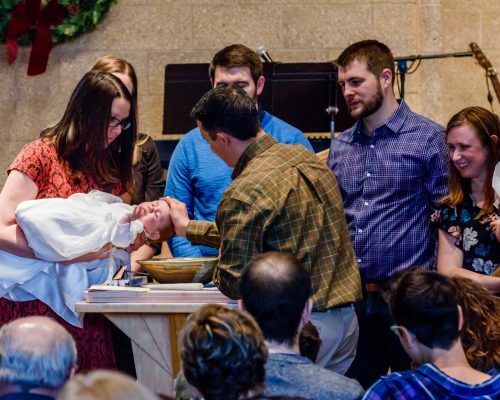 Holy Baptism is once and for all. Holy Baptism unites us as the people of God. Holy Baptism is how we share in the death and resurrection of Jesus Christ. Instruction for Holy Baptism is available to anyone wanting to be baptized or have their child baptized. All ages are welcome. You are welcome and encouraged, to attend a baptism class before your child is born. Baptism usually occurs before a child enters the Confirmation program in Grades 6-8. Confirmation is also called the Affirmation of Baptism. It is a time when youth who were baptized as infants or children, affirm the baptismal promises made by their parents and sponsors. It is when they take on the responsibility of learning and growing in their own faith with the continued support of parents, sponsors and the church. Classes are held from 6:00 – 7:30 pm. Childcare is provided.